Last week we had almost 130 wonderful blogs link up! Thank you each and every week for everyone who hops by. You have made this a place to meet friends and other great wonderful blogs and we all really appreciate it. All Featured Reads get a promo code for $5 off any ad at Nanny2Mommy! 2. Place the badge somewhere on your blog. 3. Link up your main blog page. Our hop is open from Thursdays 12:01am to Wednesday 11:59pm. Hi there! Thanks for hosting! 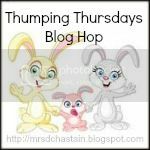 Love me some blog hopping! I follow you via GFC! Thank you for stopping by again and commenting. I love the flinger solution and that pumpkin pie - AMAZING! I am going to try it. Stopping by from the Thumping Thursday hop. Thank you for hosting. Your first GFC follower. Thank you for stopping by and commenting and joining our community. It's great to have you. I stopped by your blog and followed back. Love the empowered momma concept. We all need a bit of encouragement and hopefully you can find that here also. ooops, page didn't load up. I'm still your newest follower. Thank you for joining and commenting. I appreciate it. I am following you back. Thank you for joining the hop. It's great to have you. Thank you for your wonderful words about the blog. I hope I can bring you something that you can make your own. I stopped by your blog and I know I'm going to get a lot from it so it's a mutual swap. New follower from the hop! Thanks for hosting this week! Thank you for joining our community and for commenting. I am following you back. Thank you for commenting on joining our community. I stopped by your blog and am your newest follower. I loved seeing your pictures of Venice and Marseille and Spain. It reminded me of my trips. Thanks for the stroll down memory lane. Thank you for commenting. I always appreciate comments. I love the Santa pics on your blog. They are great. I know we will figure out the Share buttons. Thanks for your help. New follower from the hop. Thanks for co-hosting! Thank you for stopping by and joining our community. It's always great to have new members. Love your blog name. I just did a post on your "juice." Thank you for stopping by and commenting on joining our community. I stopped and became your newest follower. You have quite a talent for making and decorating cakes. Your cakes are AMAZING!